Several decades ago, when veteran radio news reporter Scoop Nisker closed out his broadcasts by telling his audience that if they didn't like the news they should "go out and make some of your own," little did he imagine that the Bush administration, and a host of its surrogates, would become masters of that domain. "Conservative foundations have overt political and ideological agendas and invest comprehensively to promote a given issue on every front. In the words of the director of one foundation, the right understands that government policies are based on information from "a conveyer belt from thinkers, academics and activists," and provides funding accordingly." <BUMP> Deserves a second look. Now I know how Kusinich feels. I believe that God has planted in every heart the desire to live in freedom. Why is it when the media tells the TRUTH it is "leftist liberal"? What is called when FOX lies and hides all the crap Bush REALLY does or says? "Rightist lieshit"? PBS has the best overall rating for accuracy than ANY other news stations. 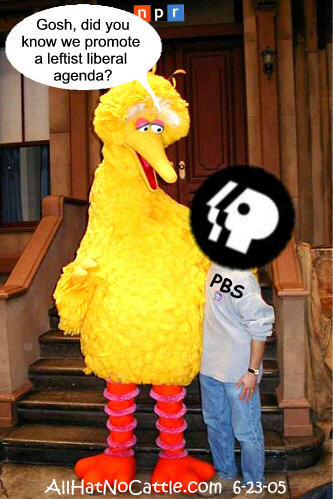 But HELL, lets get rid of PBS because it is one of the ONLY stations poor kids can get for free. EVEN if they don't have cable. first of all truth and leftist liberal don't go toghether. it is one of the ONLY stations poor kids can get for free. EVEN if they don't have cable. wow free brainwashing. how lovely. FREE BRAINWASHING - go to church. Watch FOX news. Listen to Bucky and his like. Sorry you don't have the intelligence to watch Sesame Street and be able to tell the difference. i guess if you got 2 cents go ahead and throw it in. By now, I'm sure you're aware of the bogus and spun AP article (and video) meant to be the "Bush lied" smoking gun for the left, that was quickly destroyed by the right side of the blogosphere. This didn't matter because the anti-Bush media jammed it down the public's throat for two days, never explaining the flat out lie it contained, not to mention that the first impression means everything, so the damage that had been done is really irreversible. The AP clearly planned this whole thing out, because they must have known the bloggers would bust this. After all, one of the writers was Rathergate era CBS 60 Minutes II producer (shocking huh? ), so they waited until late friday night, when the evening news programs were all over and virtually no one would ever get the news, the AP issued a "Friday night clarification". That clarification basically admits to a flat out lie. They admit that they made a claim in the original story, that they said the story supported, when it didn't at all... and they now admit that.. but if they're really interested in "truth", why did they never even put the story out on the wires? Why is it still being burried? I mean, we know most of the media wouldn't pick it up anyway, but still. Well a couple bloggers have stayed on it and noted that one media outlet did the noble thing. Powerline and Patterico both point out that the Arizona Daily Star printed it on the front page. I'm not holding my breath for the rest of the media to follow suit. They got their desired effect out of the original lie... Why make a big deal out of reporting the truth now, and risk appearing to defend the President? link.....link......link.....link....Don't even know what you are referring to Bucky and would like to read it for myself. We constantly ask for links - what is the problem? A link is the place we can click on and it takes us to the site where you have gotten your info.......understand?